After a courageous battle, Casey lost his valiant fight against cancer. He made his journey to the Rainbow Bridge on July 5th. He was doing very well for almost a year. He spent the last several months of his life with my husband, Bill and me and six housemates. His final year was of good quality and was pain free. Up until the end he would wag his whole body with joy when we came home and especially at mealtime. He was the happiest boy in the world. If he knew of his fate, it didn&apos;t show or maybe he knew and wanted to enjoy every moment he had left. Well, that he did. He was always up for a game of fetch or Frisbee. His favorite game was retrieving golf balls for Bill. We played tirelessly each evening after dinner. Casey&apos;s medical care was quite costly but we never refuse to help a golden, no matter how serious his condition, as long as he has an opportunity to live longer and enjoy a good quality of life. That was the case with Casey. Can you please find it in your heart to make a contribution in Casey&apos;s memory so that we may continue to give other golden retrievers the same high quality of medical care Casey received? Any donation, no matter how small, would be greatly appreciated. 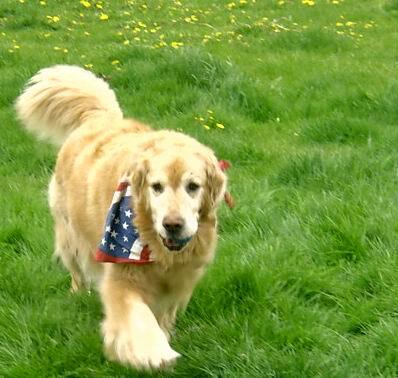 In loving memory of Casey, Long Island Golden Retriever Rescue, thanks you. Please note "Casey" on your check.